Shake up your morning routine (in a healthy way) with this Hazelnut Chocolate French Press Latte! It's only 4 ingredients and takes less than 10 minutes! This post was sponsored by Stash Tea. Thank you for supporting the partnerships that allow Brewing Happiness to grow and exist. xoxo. While the milk is heating, grind your coffee beans and add them to the french press. Tear open the Chocolate Hazelnut Decaf Black Tea bags and empty the contents into your french press, along with the maple syrup. Stir the contents well, then add your "lid" and let steep for 5 minutes. The sun wakes me up at 7:30 am. That’s when it starts to bounce rays of light off the building next door and right into my bedroom. And unless my upstairs neighbor is stomping around, it’s a particularly quiet and special time of the day for me. I love mornings. I love that they are all mine and I love that they seem to move slower than the rest of the day. I find a great sense of peace in my morning routine. I have lots of small rituals that fill up my morning schedule. Check phone. Take medicine. Drink water. Get out of bed. Make breakfast. But my favorite ritual has and always will be, my morning french press. I never get bored of heating up water in my kettle, turning on a podcast, grinding my beans, and drinking my coffee. There is something really magic about being a coffee loving person. It’s not just the caffeine either that makes me love it so much – it’s the culture, the ritual, the care. If you’re a fellow coffee person, I’m guessing you can relate. I have found that the first cup of coffee in the morning is a universally loved tradition. It’s a huge part of the reason this blog is called Brewing Happiness. There is a lot of joy that comes from that morning cup of joe. But what if you could up the ante on your morning coffee game? Would you be up to it? What if I said it was hazelnut chocolate AND super easy… Well then, I might be convinced to change my routine. I love me some hazelnut + chocolate combos, and when you add that to the idea of my morning french press – you’re onto something revolutionary. The key to making such an easy and delicious latte are the Stash Tea Chocolate Hazelnut tea bags. They are naturally so flavorful without trying too hard, and it allows you to continue your french press routine in a new way without trying too hard. Just add some tea to the coffee, a little maple syrup, and non dairy milk. VOILA! A new latte (and morning routine) is born! I’m really excited to add this to my Fall/Winter morning schedule, because honestly – who doesn’t want chocolate + hazelnut in their coffee???? 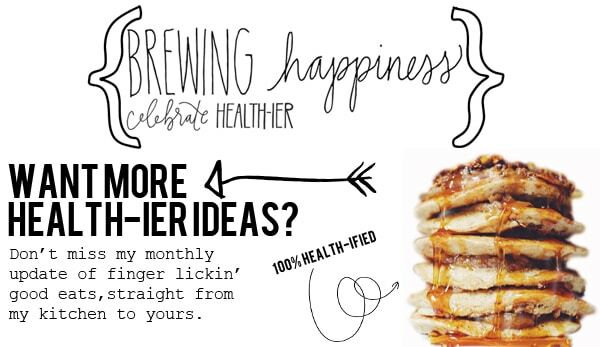 Especially if it’s health-ier for you than say… Starbucks. Or wherever the heck they pour those gross sugar syrups into your coffee. This way you keep the dignity of the coffee, as well as add some quality flavors with the tea, and no morning rituals are harmed in the process. ENJOY!